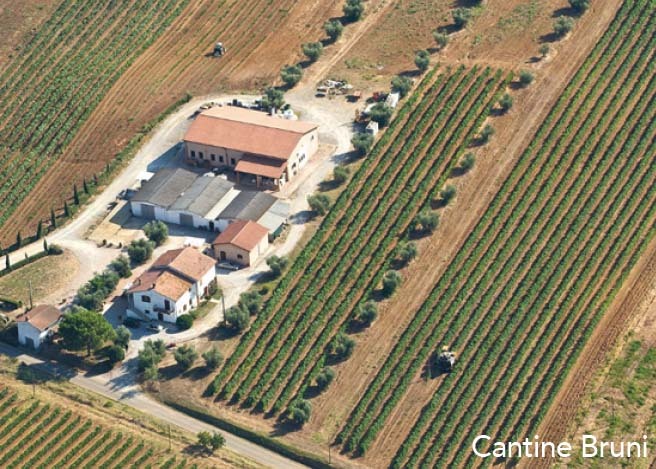 Founded in 1974, Cantine Bruni has become a prominent property in the Maremma Toscana. Cantine Bruni marries the native varietals of the region with the Maremma’s ideal microclimate of favorable soil and climate.Always seeking to elevate the quality of its wines, Cantine Bruni embodies the potential of this unique land. A succession of gentle hills watching over the majestic contour of the Monte Amiata. It’s precisely from one of these soft and sensual hills that the story of Fattoria Le Pupille begins and leads it to how it is seen today. 1985:It can be considered the year of re-foundation of the winery, when from a family wine estate, it starts becoming a modern and entrepreneurial viticultural reality to which Elisabetta Geppetti dedicates energies and dreams. Elisabetta abandoned the university halls for the vineyards and the winery, replanted Cabernet Sauvignon on a few vines of Sangiovese, which in ’85 starts bearing fruits, all with the support of Giacomo Tachis, much more than a technical consultation. It is the birth of the project that has made the winery the true pioneer of Maremma. In 1982 the first ‘official’ label is released, a Morellino Riserva 1978. In 1987 it is the time of Saffredi, the wine that has made Maremma known for its excellence, not only in Tuscany, but much further away form its borders. In 1996, the purchase of the Poggio Valente vineyard gives an even more important turn to the winery. Today Tuscany is home to the Tolaini Estate, a winery that combines these ancient elements with modern winemaking. The symbol “ ” is taken from the ancient alphabet of the Etruscans and is equivalent to our modern letter “T”. To honor the connection of the ancient with the modern, the symbol “ ” has been chosen to represent the Tolaini name. Pier Luigi’s 4-year search for a top Tuscan vineyard brought him to Chianti Classico, to the prestigious region of Castelnuovo Berardenga, and to the properties at Montebello and San Giovanni. When Pier Luigi first set foot on the amphitheatre- shaped vineyard at Montebello, he knew he had found the perfect balance of climate, soil, and exposure. Santa Margarita Ranch enjoys a long and illustrious cultural pedigree, beginning with the Chumash and Salinan Indians more than 10,000 years ago. In the 1770’s, the ranch became part of Father Junipero Serra’s famed Mission Trail. Grapes were first planted at the ranch by Franciscan missionaries in 1780. Today, Santa Margarita Ranch remains one of California’s oldest continuously operated cattle ranches. The estate, Margarita Vineyard stands alone as the southernmost vineyard in the Paso Robles region, tucked beneath the peaks of the Santa Lucia Mountains just 14 miles from the Pacific Ocean. 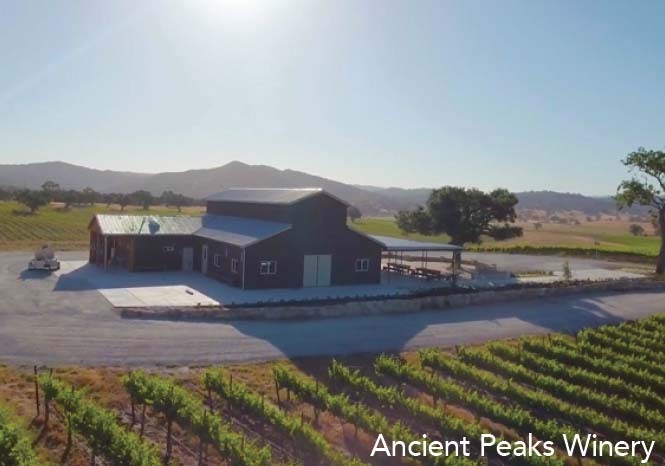 Ancient Peaks Winery represents the shared vision of three longtime local winegrowing and ranching families – the Filipponis, Rossis and Wittstroms. Two generations are actively involved in the winery’s daily operations, all dedicated to producing extraordinary wines from Margarita Vineyard. Rob Rossi acquired Santa Margarita Ranch in 1999. His friends Doug Filipponi and Karl Wittstrom soon joined him as partners. That same year, the Robert Mondavi family planted Margarita Vineyard on the ranch under a lease agreement. In 2005, the three families acquired ownership and control of Margarita Vineyard. They knew that they could cherry-pick their favorite blocks and make distinctive wines with a strong sense of place. The name Ancient Peaks was chosen to honor the towering Santa Lucia Mountains that border Margarita Vineyard. These peaks define the land’s complex geology and regulate the vineyard’s climate, ultimately shaping the character of the wines. At 85% Vermentino and 15% Viogner, this wine is straw yellow with greenish highlights. The bouquet is intense with flowery and fruity with notes of exotic fruits and the typical hints of this grape variety of peach, herbs, and wildflowers. It is fresh on the palate, full and harmonic, with a long mineral finish. It pairs well with seafood dishes and antipasti with lobster and other shellfish. 12.5% Alcohol. This wine is 50% Sangiovese and 50% Cabernet Sauvignon. It is named after “Mama” Elsa Bruni. It shows purple to ruby and exhibits a tart fruity nose of cranberries with hints of vanilla and spice. It has notable density, gorgeous depth and richness, with soft tannins. Alcohol 13.5%. Straw yellow describes the color. The nose is crisp and alluringly aromatic with profiles of grapefruit, orange, and rosewater. The palate shows more citrus with a hint of spice and ripe fig followed by a refreshingly crisp acidity. This pairs well with an Italian coastal favorite – Spaghetti allo scogio – pasta with crustaceans. Alcohol 13.5%. Made of 85% Sangiovese and 15% Merlot, this wine is fermented half in stainless and half in oak. Notes of French oak, cherry, and berry find the nose. The palate has a backbone of Sangiovese, a roundness of Merlot, and enhanced body from the oak. The fruit purity and varietal signatures are a testament to the meticulous care given to the young vines. Pairs with mild meats with red sauce. Alcohol 13.5%. At 75% Cabernet Sauvignon and 25% Cabernet Franc, this wine is rich and dark. It seems youthful with berries and cassis aromas melding with notable French oak spice. It is fermented mostly in oak and aged 16 months in 70% new barriques. The palate is tantalized with deep but reserved fruit flavors framed by rich oak. The excellent balance of fruit intensity with fine tannins indicates a cellar-worthy wine. Pairs with rich red meats and hearty sauces. Alcohol 13.5%. Elisabetta Geppetti’s commitment to the Sangiovese grape shows in this wine. A small amount of Merlot is blended to add body and a lush character to this cru wine. It is deep ruby red with purple hues. The nose has concentrated aromas of red and black cherries, blackberries, licorice, vanilla, and hints of sage and violets. The palate is rich and plush with delicious dark berry and vanilla flavors with ripe tannins and a pleasantly savory finish. It is a perfect match with cinghiale alla maremmana in umida, wild boar stew. Decant for a half hour. Alcohol 14.0%. This wine boasts of 100% single vineyard Sangiovese from estate fruit born in Tolaini’s organically farmed Montebello Vineyard “numero sette”. It is a sensual wine with notes of cherry fruit, tobacco, leather, and hints of licorice and spice. The elegant tannins balance nicely with the fruit and acidity, making this a complex wine with incontestable structure and power. A long and satisfying finish confirms this Sangiovese is true to its terroir. Pairs well with filet of beef. Decanting not necessary but is recommended. Alcohol 13.5%. The name Toscana comes from the Latin Tuscia, which the Romans called the area to honor the Etruscans, who developed an advanced civilization there before the Romans subjugated them. The Etruscans were wine makers, but the Romans preferred stronger southern wines. Thus the Etruscan wine trade faded until monks revived viticulture in the region. Wine became a daily beverage in the medieval cities of Florence, Siena, Pisa, Lucca, and Arezzo. During the Renaissance, which began in Florence, the wines of Toscana were transported throughout Europe. The noble red grape variety of Toscana is Sangiovese. Although many clones of Sangiovese exist, the superior ones are among the world’s finest vines, such as Montalcino’s Brunello, Chianti’s Sangioveto, and Montepulciano’s Prugnolo Gentile. Among other fine Sangiovese based wines are Rosso di Montalcino, Vino Nobile, and Carmignano. Tuscan wines also include the “Super Tuscans,” which are100% Cabernet or Sangiovese-Cabernet blends. Vernaccia de San Gimignano is the most prestigious white wine in Toscana, and Vin Santo its highly prized dessert wine. 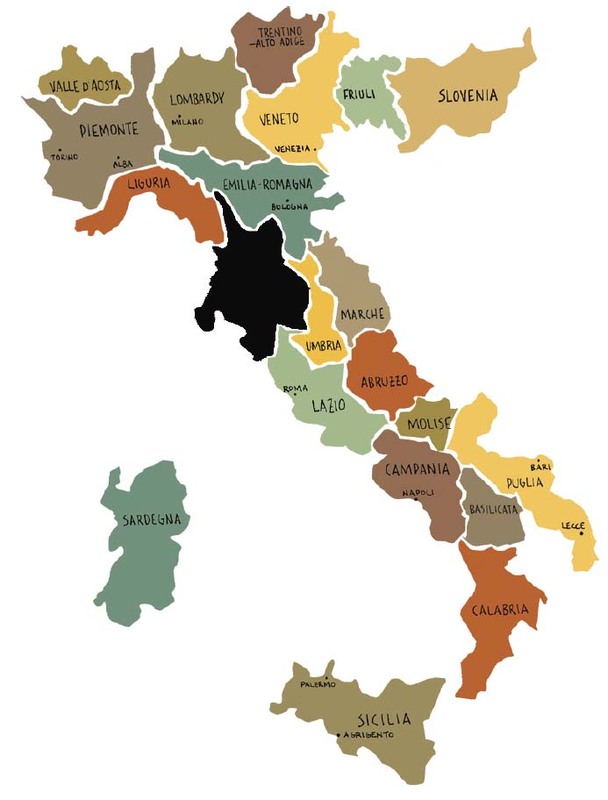 In the government system of laws that regulate wine production, Toscana boasts 11 DOCG areas, 39 DOC areas, and 6 ITG. It is 100% Sauvignon Blanc. The nose finds notes of lime zest, grassy herb, and gooseberry. The palate is crisp and clean offering quenching flavors of grapefruit, white peach, and green apple. Brisk acidity cascades into a refreshing finish. Pairs with crab cakes, shrimp pasta in white wine sauce, grilled asparagus, Thai chicken salad, and salmon with lemon and dill. Alcohol 13.4%. Known as one of Paso Robles’ most acclaimed zinfandels, this wine comprises 90% zinfandel and 10% Syrah. It opens with aromas of raspberry, boysenberry, blackberry pie, and high-toned oak. The palate is jammy with luscious flavors of blackberry, black cherry, and vanilla cream. A dash of black pepper lingers on a clean, composed finish. Pairs with wood-fired pizza, lasagna, and grilled chicken. Alcohol 14.8%. This wine is 92% Chardonnay and 8% Muscat. It offers aromas of pear, fig and lime zest with a hint of apple blossom. The palate begins with a creamy note, unfolding with bright flavors of nectarine, white peach, pineapple, and lemon drop. Brisk mineral accents and fresh acidity make a lively finish. Pairs with fresh lobster, panseared scallops, shrimp pasta with white wine sauce, aged cheddar, and chicken with lemon butter. Alcohol 13.5%. This wine is 83% Merlot and 17% Malbec make up this wine. It delivers rich black and red fruit aromas with intriguing hints of cedar, mocha and eucalyptus. The palate is juicy and rounded, offering black cherry, raspberry, vanilla, and brown spice. Firm tannins and luscious acidity take this Merlot to the next level. It pairs with pan-seared duck breast, bacon-wrapped filet mignon, grilled veal chops, and pasta with savory lamb ragu. Alcohol 13.9%. Renegade is comprised of 80% Syrah, 18% Malbec, and 2% Petit Verdot. The nose finds concentrated red and black fruit aromas with hints of cedar, smoked bacon, and oak. The palate is packed with velvety layers of boysenberry, black cherry, blueberry, and cranberry, with trailing hints of vanilla, caramel, coffee and black pepper. Well balanced with a lavish finish. It pairs well with full flavored dishes such as parmesan-crusted rack of lamb, pepper steak with mushroom sauce, and French Onion soup. Alcohol 14.6%. This is a blend of 75% Cabernet Sauvignon, 15% Syrah, 5% Malbec, and 5% Petite Syrah. The nose finds aromas of plum, blackberry, lavender, black olive, and sarsaparilla. The mouthfeel is broad and viscous with layers of boysenberry, black cherry, vanilla cream, and polished oak. The long finish is impeccably balanced with elegant structure. It will evolve for years to come. Pairs with New York strip steak, filet mignon, and roasted lamb. Decant for half an hour. 996 cases produced. Alcohol 14.8%. At 100% Cabernet Sauvignon, this wine boasts of the best of the best in grape selection. It has aromas of blueberry, black cherry, tobacco, graphite and toasted wood. Dense, juicy flavors of cherry and red currant yield to impressions of dark chocolate and oak spice. Firm tannins set the tone for a lively, structured finish. It will pair with rack of lamb, grilled steak, hearty stews, and heavy sauces. Decant for one half to one hour. 298 cases produced. Alcohol 14.7%. Located along the Central Coast between San Francisco and Los Angeles, San Luis Obispo County, is one of the original counties of California, named after Mission San Luis Obispo de Tolosa, founded by Father Junipero Serra in 1772. The small size of the county’s communities, scattered along the beaches, coastal hills, and mountains of the Santa Lucia range, provides a wide variety of coastal and inland hill ecologies to support many kinds of fishing, agriculture, and tourist activities. 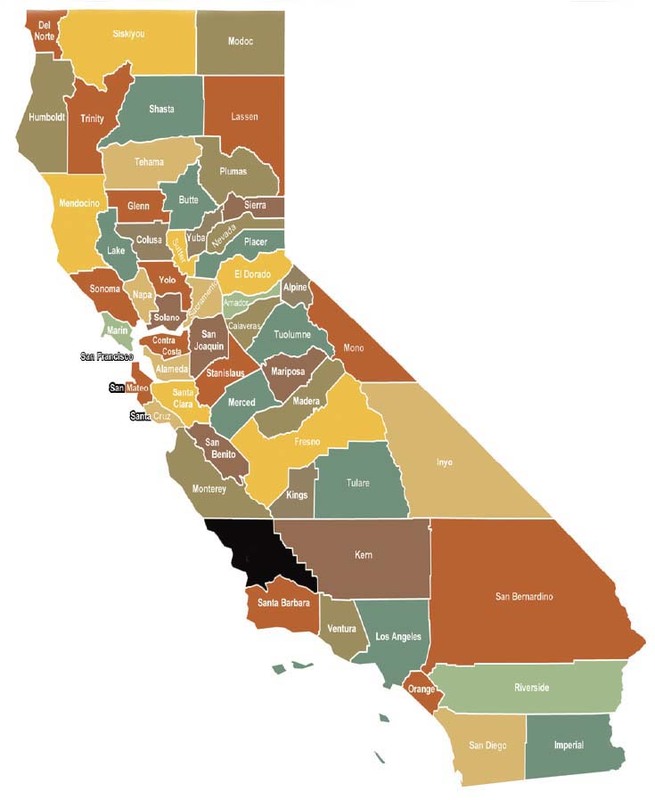 The County is the third largest producer of wine after Napa and Sonoma and includes nearly 300 wineries and four distinct viticultural areas. Edna Valley is California’s coolest wine region just five miles from the Pacific Ocean, known for Pinot Noir and Chardonnay. The coastal valley Arroyo Grande has a more temperate climate, and Paso Robles is the largest and warmest of the areas, known for its Rhone varietals, Cabernet Sauvignon, Zinfandel, and more recently Spanish grape varieties. Really? A Baked Potato Bar? neutral than a baked potato? It’s the perfect canvas for almost any flavor! And, perhaps you can turn this concept into a cool office lunch gathering! Scrub very well to remove annoying sand and dirt and dry well. Coat the potatoes lightly in oil (your choice here). potato sizes vary. Poke with a small knife until it is easily pierced to the center. Use toppings aplenty. Have fun! Unless it’s disgusting trust your instincts. vegetables, there are so MANY possibilities! Enjoy! And… Remember, I’m hoping to hear from you on your results! Share pictures of your creations too! In business for over 20 years, we dedicate ourselves to delicious wines and to telling their stories from grape to glass. We are the only company online that specializes in both Californian & Italian wine of the month clubs. Call us, and most of the time, the owner answers.